My studio has turned into a black hole for sheet music. Two weeks ago I lost - completely lost - an envelope of music that I'd been sent to prepare for a gig. Fortunately, that envelope was full of photocopies, that music was public domain, and I was easily able to print it off from the internet, learn my part, and then play from the orchestra's originals when I showed up to work - but this was unprofessional and unlike me. Then, today, I searched through three large stacks of material for my Gershwin and Debussy arrangements. I have another CD Release Recital this weekend and I thought I'd brush them up, you know? 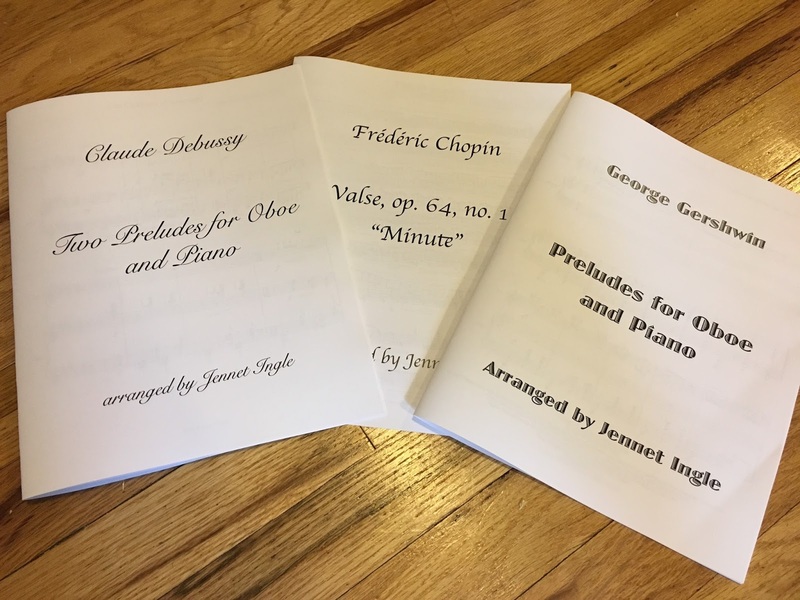 My focus had been on the solo Bach pieces as I performed them last Monday for a South Bend Symphony press event, and somehow the other works went entirely missing. Fortunately, they are MY arrangements, and I have plenty of copies and could even have just printed them off from the computer again - but still. What's the next thing to go? Possibly my brain. Or my entire head. BUT now let me tell you about my next event. Paul and I will be at First Presbyterian Church in Michigan City, IN, next Sunday at 3. That's Central Time. I'll play some of the material from my CD (Music That SHOULD Have Been Written for the Oboe, available at Amazon, iTunes, CDBaby, and jennetingle.com!) I'll play a great Bach duet with violinist Nic Orbovich, founder of the Michigan City Chamber Music Festival. It clearly should have been written for the oboe. AND I'll offer a movement of Mozart's terrific Oboe Concerto, as a preview of my performance in Northwest Indiana next month. The concert is free and open to the public. There will be a reception afterward, and PLENTY of CDs to purchase if you are so inclined. I can sign them. I'd love to chat. This will be FUN.